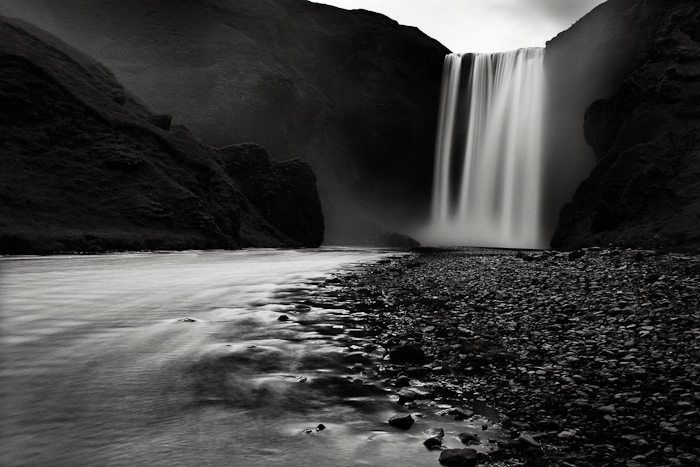 Skogafoss is one of the most beautiful waterfalls on Iceland and also one of the most visited and photographed spots in the country. When we saw how many people are observing the waterfall during the day we decided to avoid the crowds and come at night, which fortunately never gets too dark during the long summer days. We arrived to the parking place near the waterfall just after midnight and immediately realize the different atmosphere this place gets after the sunset. Firsts of all, there were no people “fighting” for the best spot to take picture, and secondly, one could really feel the mystical atmosphere of the 60 meter tall waterfall and the surrounding area. Like everywhere on Iceland there is also old legend connected to this place. According to which, one of the first Viking settlers in the area, Thrasi Thorolfsson, buried a treasure in the cave behind the waterfall. Later on, many have tried to find it, but only one young man had at least a little success. He found the right place, where the chest was hidden, but unfortunately he was only able to retrieve the ring connected to the chest, nothing more. So luckily for us, everybody still has a chance to find the treasure. However, I have to say did not even try to look for the gold, but instead I did concentrate on my final photograph, which becomes my own personal treasure at the end.